When I was growing up in Kuwait, my father used to go to the farmers market once a week to buy vegetables and fruits. I still remember that every time he came home, it looked like he bought the whole market. He would bring home squash, tomatoes and cucumber to make salad as well as stuffed or pickled cabbage, cauliflower, etc. 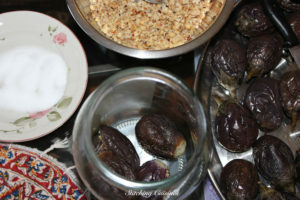 Once he came home from the farmers market with three sizes of eggplant; American eggplant to make Maqlouba and Moussaka, Italian eggplant to stuff with rice and meat or make Sheikh al Mah’shee, and baby eggplant to make Makdous, which is pickled stuffed baby eggplant. 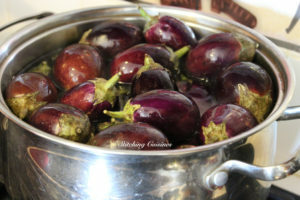 One day, my father liked how delicious the baby eggplant looked; so, he bought a whole box, 16 pounds. My mother decided to make half of it pickles and the other half Makdous. 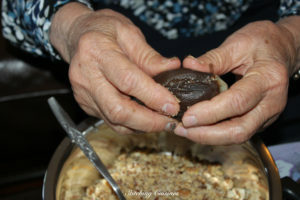 It was my first time watching my mom making the Makdous. When my mother finished preparing it, I asked her when we could start eating it. She told me it needs 3-4 weeks to be ready for eating. 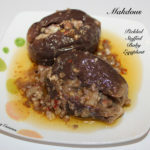 I anxiously waited to eat the Makdous and it was worth it! Wow! It was super delicious. Nowadays, I make Makdous on a regular basis because my family loves it. 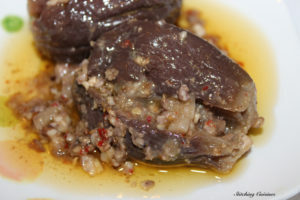 I wanted to share this delicious recipe with all of you. Enjoy! 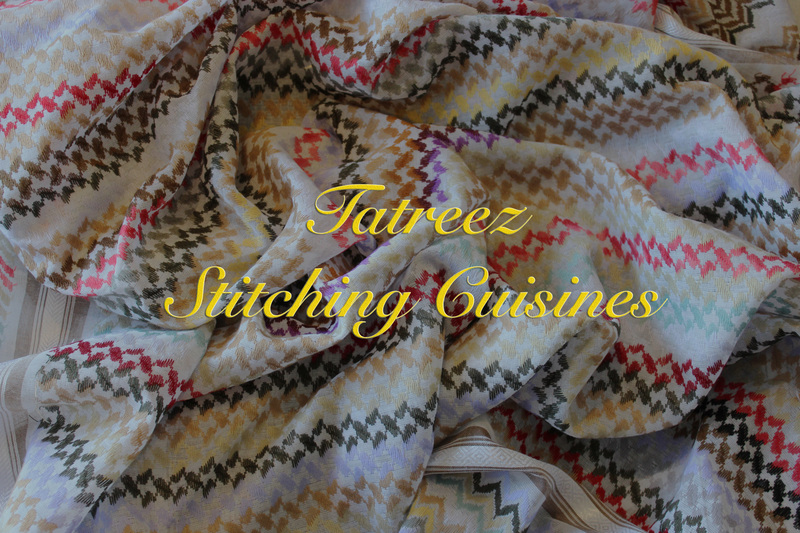 This process has a delicious outcome and worth the wait! I’ve provided step-by-step instructions with pictures. Rinse eggplants very well and put to the side. Fill a large pot with water and a spoon of salt. Place the pot on high heat. While waiting for the water to boil, prepare filling. 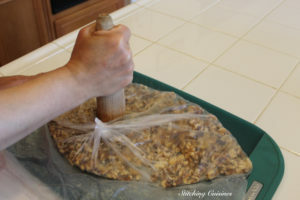 Place walnuts in Ziploc bag and use a pestle or rolling pin to roughly crush the walnuts. 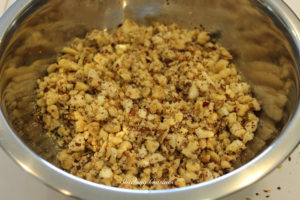 Place the raw walnuts, crushed red pepper, salt, and raw garlic in a bowl and mix together until well combined. 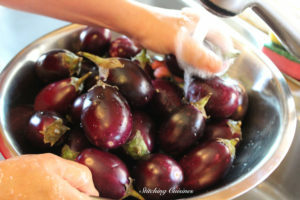 Once the pot of water boils, add all the eggplants, and place a plate or heavy object over the surface of the water to keep the eggplants submerged under water. 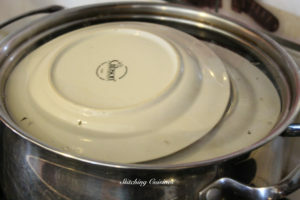 Cover the pot with a lid. 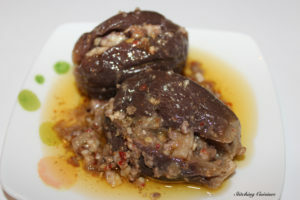 Keep the stove on high heat, allowing the eggplants to fully cook. 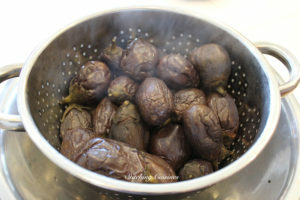 After 30 minutes, turn off the stove and transfer the eggplants to a colander to drain. 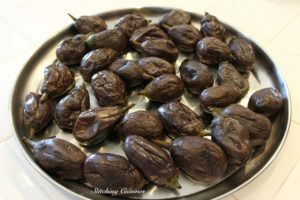 After all the excess water is drained, lay all the eggplants out on a tray to fully cool. Slice eggplants lengthwise, halfway through. Make sure the eggplant is still in tact. 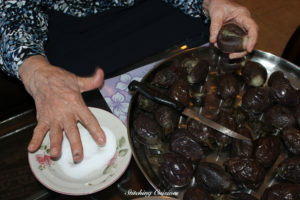 Rub salt on the inside of the eggplant, then place the filling inside the opening. 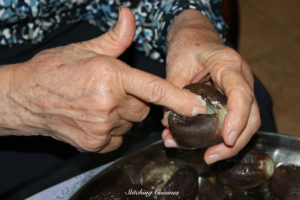 Push the filling in using your finger. 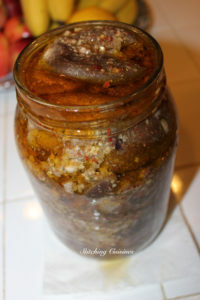 Close the eggplant and place it in the jar. 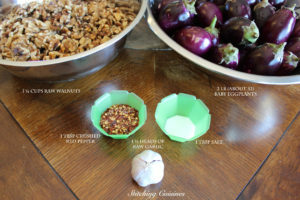 Continue this process until all the eggplants are stuffed. 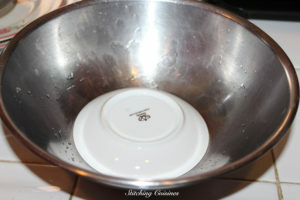 Place a sieve in a well fit bowl. 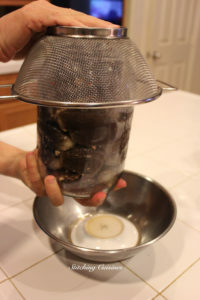 Place both the sieve and the bowl upside down on the mouth of the jar. 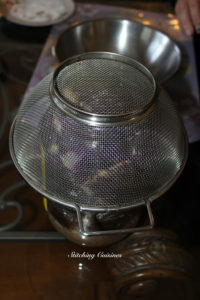 Quickly and gently flip the jar over, so it is balancing upside down on the sieve and bowl. 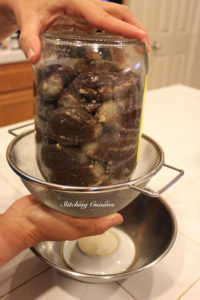 Keeping the jar upside down in the sieve/bowl, place the jar in the fridge to keep it from souring as the excess liquid strains from the stuffed eggplants. 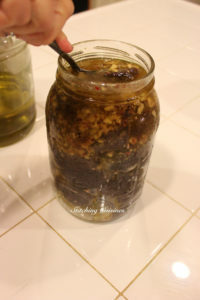 Check on the jar every few hours to pour out any liquid that has strained into the bowl. 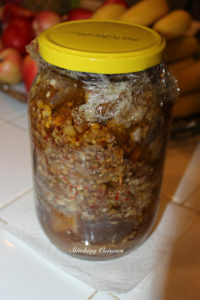 After 48 hours, when there is no remaining liquid, remove the jar from the fridge. Flip the jar upright. Add any remaining filling from the previous day into the jar. 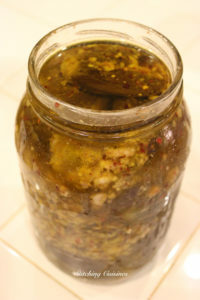 Fill the jar with olive oil until all the eggplants are covered and the jar is full. 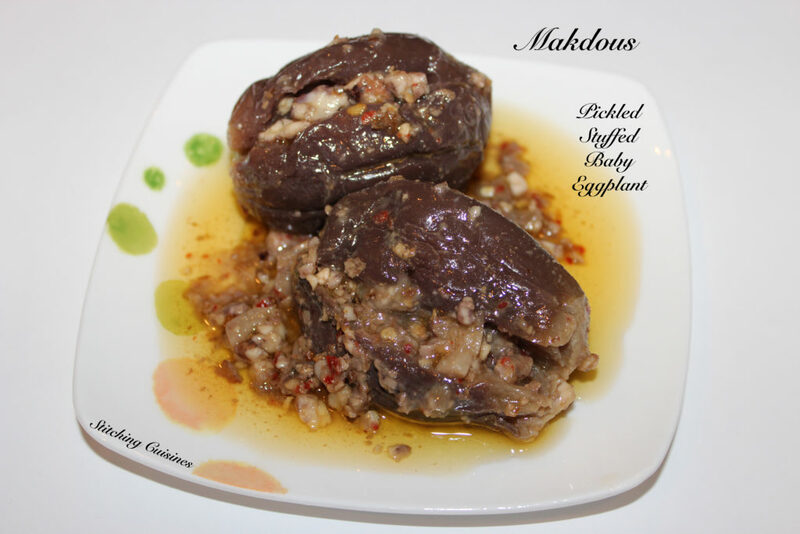 Use a spoon to push down the eggplants if needed. 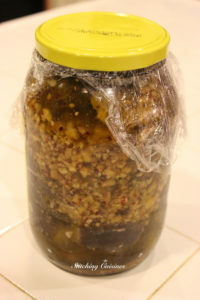 The jar should be tightly packed. 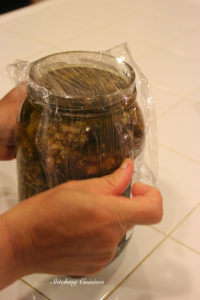 Seal the jar using 2 layers of plastic wrap and the jar’s proper lid. Close tightly. 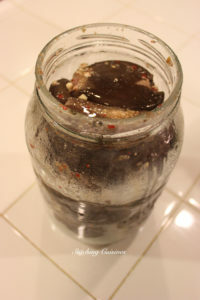 Place the jar in a dark, cool area for 3-4 weeks. The longer, the better. After a month has passed, pop open the lid, grab a piece of toasted pita bread, and enjoy! 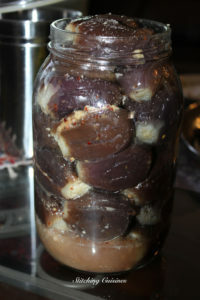 Waiting 48hrs for all liquids to strain from the jar of stuffed eggplants is a crucial process in order for this recipe to work. Patience is key. The month wait is worth it, I promise. 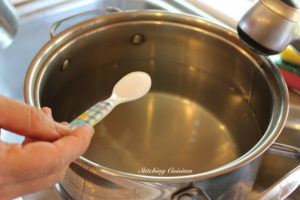 Once the pot of water boils, add all the eggplants, and place a plate or heavy object over the surface of the water to keep the eggplants submerged under water. Cover the pot with a lid. Keep the stove on high heat, allowing the eggplants to fully cook. After 30min, turn off the stove and transfer the eggplants to a colander to drain. 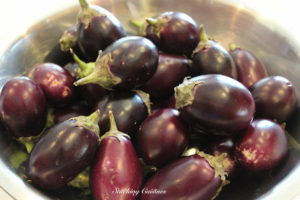 After all the excess water is drained, lay all the eggplants out on a tray to fully cool. Slice eggplants lengthwise, halfway through. Make sure the eggplant is still in tact. 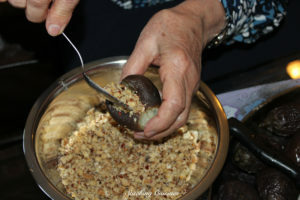 Rub salt on the inside of the eggplant, then place the filling inside the opening. Push the filling in using your finger. 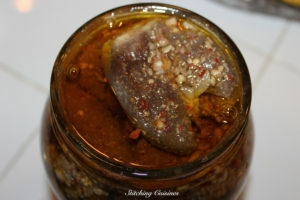 Close the eggplant and place it in the jar. 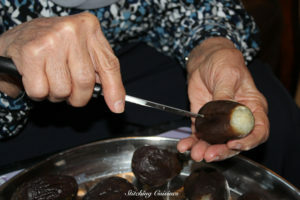 Continue this process until all the eggplants are stuffed. Keeping the jar upside down in the sieve/bowl, place the jar in the fridge to keep it from souring as the excess liquid strains from the stuffed eggplants. 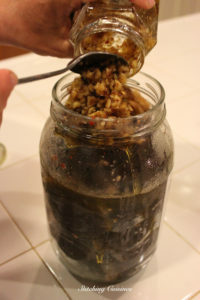 Check on the jar every few hours to pour out any liquid that has strained into the bowl. 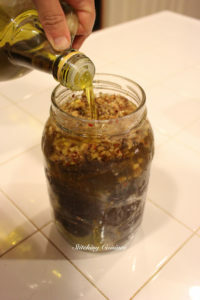 After 48hrs, when there is no remaining liquid, remove the jar from the fridge. Flip the jar upright. 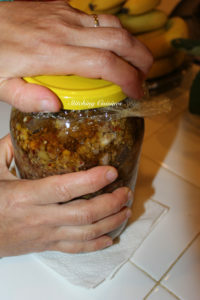 Add any remaining filling from the previous day into the jar. 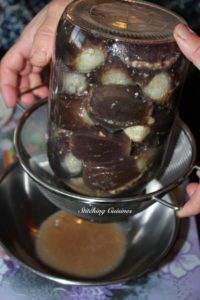 Fill the jar with olive oil until all the eggplants are covered and the jar is full. Use a spoon to push down the eggplants if needed. The jar should be tightly packed. 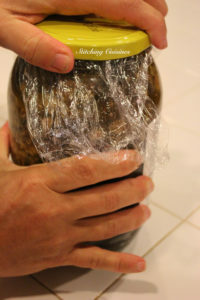 Seal the jar using 2 layers of plastic wrap and the jar’s proper lid. Close tightly. 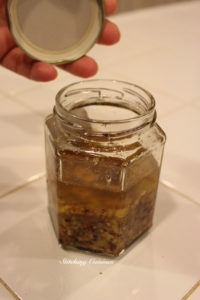 Place the jar in a dark, cool area for 3-4 weeks. The longer, the better. 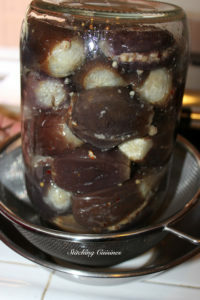 *Waiting 48hrs for all liquids to strain from the jar of stuffed eggplants is a crucial process in order for this recipe to work. *Patience is key. The month wait is worth it, I promise.